Welcome back, and as I write this, winter is approaching and the countdown to Christmas has already begun. Exciting times in schools! I thought in these next blogs it would be good to reflect on the whole Catch Up® Numeracy process, and look closely at the 4 stages that form it. It can be all too easy as an established deliverer to focus on the everyday practicalities and any problems that face you session by session, but, hopefully, some time spent reading these blogs might remind you of – and reinforce – the philosophical foundations which underpin the intervention. What I would like you to keep in mind throughout is the cyclic motion of the process, and once within the process, then Stage 4 feeds directly into Stage 1. Let’s look today, though, at Stage 1: the assessments for learning. For the new trainee, the prospect of all those assessments must be quite overwhelming. Yes, there are 27 separate assessments to complete, and yes, they do take some time, but it is essential that these are completed before you begin the individual sessions. There are so many assessments because Catch Up® Numeracy includes such a comprehensive range of mathematical concepts. Always try to use a standardised test before beginning the intervention. Learners will undoubtedly learn from the assessments, as your model and explanation can plug a gap. Also, when the learner makes an error you will address any misconceptions. This might very easily result in learners improving their performance, so obtain your entrance data at the earliest opportunity. To measure the impact of your intervention, gathering data at entrance, mid-way and at the end of the intervention is recommended, but as a very minimum, you will need entrance and exit data. The interview can provide some surprises, for example, “How easy do you find numeracy/maths (out of 10)?” Younger learners will sometimes score themselves highly, not recognising – due to the differentiated activities and adult support at Primary school – their position on the ability ladder. Older learners are more likely to be aware of their difficulties and can score themselves very low. This negative attitude can present another barrier to overcome. Scoring themselves can cause some learners difficulties. Using a line or ladder with pictures from ‘smiley face’ through ‘neutral face’ to ‘sad face’ can give a young learner support, however, I have found a tendency for learners to place themselves at the centre and this is difficult to avoid. Older learners find scoring themselves out of 10 less problematic and this can be a valuable part of their entrance data. After using the interview again as part of their exit data, I would remind the learner how they scored themselves at the entrance. They may find this comparison very interesting! A good, clear model is crucial. If the learner then gives an incorrect response, it is not because they did not know what they had to do, but rather did not know how to do it because the mathematics was the issue. Catch Up® have been very successful in making the instructions for each assessment very clear and you need to ensure you read them carefully. Always keep in mind what each assessment is assessing and assess that. For example, ‘writing numbers’ is to assess if the learner knows what the written numeral should look like. It is not to assess if they hold the pencil correctly, and not to assess if they write the numeral in the way that you would like. Many learners form numerals from the bottom up; this is not desirable, but if the final written numeral is correct you must accept it in the assessment. (Remember, if you had not been there to see them actually writing, you would not have questioned the formation.) However, make a mental note for future reference as number formation might be something you work on improving. ‘Without hesitation’. This relates directly to the point above. For example, Remembered facts are just that, it is not about being able to calculate 8 – 3. That skill is assessed in HTU:subtracting. ‘Without hesitation’. In Estimation:approximate calculation, in the lower number ranges, the learner might know the answer to 3 + 1, 6 + 2 and even 2 + 8, for example, and give the correct answer very quickly. However, there will come a point (9 + 3, 8 + 7 come to mind), where you will see clearly that the child is calculating rather than estimating, and you must stop them and mark this as an incorrect response. Estimating is such an important skill – it is, in fact, the first step in checking an answer – that it is essential you teach this skill. In the given model, your answer is not exact, which is vital as it will give the learner confidence to give a quick estimate. As educators, we like to celebrate learners’ successes. However, what is more important in an intervention is that you know what the issues are. Always err on the side of caution by marking incorrect responses as such, rather than making an assumption that ‘she knew the answer really’. A learner who does not begin counting verbally from 0 when asked, might have just forgotten the instruction and it could just be a ‘glitch’, but stop the assessment and mark it with a dot. Do not make assumptions – incorrect assumptions may be the reason the learner is struggling now! Keeping all these points in mind, with older learners you might need to use a little discretion, for example, with Derived facts. An older learner might use the commutative and N+ elements to derive 2 + 3 from 3 + 1, so would not identify it as a distractor. I would accept this; however, if they could not recognise that 1 + 2 does not help with 4 + 3 in the next distractor, I would stop them. This shows they are not understanding the derived facts strategy and need support. It is important that you are not frightened of reusing the assessments for learning when appropriate, and this can be quite early in the intervention if you suspect there has been a ‘glitch’. A Catch Up® Numeracy session can check the learner has the understanding to confirm that ‘she knew the answer really’, and you can then reassess the particular incorrect response and then continue the assessment and update the learner profile accordingly. 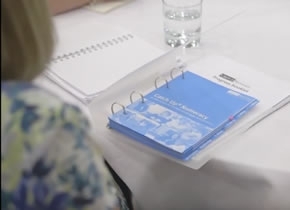 Once the learner has developed understanding of a component or subcomponent, you may also choose to use the assessments for learning as a method of moving the learner up through the Catch Up® levels quickly. Remember that you do not need to begin the assessments from the beginning again; assess from where the learner is, continue following as instructed and, again, update the learner profile accordingly. The assessments for learning are a crucial part of the Catch Up® process, as they give you – at the outset of the intervention – a clear picture of the learner’s individual needs. But they have a dual role, as the deliverer then has the option during the intervention to use them as assessments of learning, and updating the learner profile to reflect increased ability. Next time I will move on to Stage 2.